An awesome sweet flavor which can be used to spice up your juice or treats; Cinnamon keeps your mouth loaded with an incredible cinnamon taste! It’s delightful and powerful! 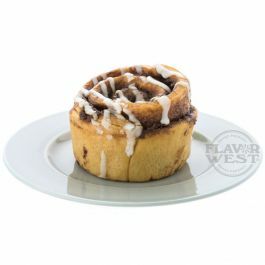 Type: Cinnamon Roll Water Soluble Flavoring. Ingredients: Natural and Artificial Flavoring, Propylene Glycol. USP Kosher Grade Flavoring. Usage Rate: 15-20% for E-use. Flavor suitability: beverages, chocolates, drinks, vegetables, fruits and chocolate desserts, caramel, bakery recipe and more. Specific Gravity: 1.04 No Refunds on Flavoring. One of my favorite flavors. By itself or as a base to be mixed with some fruit flavors. Every DIY'er should have a bottle of this in their arsenal. This is often and all day vape for me. This is a most enjoyable flavor to vape taste like a well made cinnamon bun, not too much cinnamon. I mixed it 20% with settings of 3.8v and 1.6 coil. This flavor is a must have in my arsenal. It is a good flavor, but must be mixed with the other versions available to create the perfect cinnaroll flavor. IMO. I am almost out of a 4oz bottle and do not want to run out. I still have not been able to create what I seek to, the perfect cinnimon roll flavor. The closest thing to it currently on the market would have to be Sugar Bear . I still don't think that's quite it.....I am always looking and hoping someone has found it, but I still seek , three years later! Happy Vapings! !